The first Hyundai electric vehicle has yet to hit the U.S. market, but the automaker has revealed plans to set a new standard for the lower end of the segment. Like Tesla and General Motors, the Korean manufacturer has plans on launching a 200-mile EV by 2018. That will only be the first step. According to a new report, an electric model capable of 250 miles of range will follow two years later. Byung Ki Ahn, Hyundai’s director of green vehicles, told Autoblog about his company’s plans to push the range envelope to unprecedented levels in the affordable class. While Tesla blew past 250 miles years ago and Audi has expressed confidence in its ability to make it to 300 miles, lower-end car makers have been content to stop at 200. Considering the longest-range model remains the 107-mile Nissan Leaf, the mark of 200 miles is enough of a benchmark for most automakers. The Chevy Bolt EV due in 2016 will get there first. Tesla CEO Elon Musk says the Model 3 (at least 215 miles) will join the club in 2017. Nissan and Ford are expected to follow with their own models sometime in the following year or two. In the case of each of those manufacturers, we have seen their first offerings in the segment. While the Tesla Model S has established its reputation worldwide, the volume-selling Nissan Leaf has achieved its own loyal following. Ford Focus Electric and Chevy Spark EV have made the acquaintance of consumers as compliance cars. But an all-electric Hyundai has yet to appear. 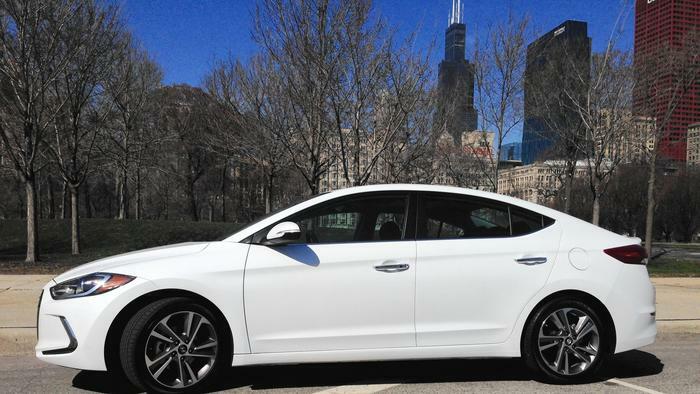 The 2016 Hyundai Sonata PHEV is the brand’s first model to run on battery power alone. Among all plug-in hybrids on the U.S. market, this model’s 59 miles per gallon combined economy (99 miles per gallon in electric mode) is bested only by the BMW i3 REX and Chevrolet Volt. In that respect, Hyundai has proven its ability to compete with the best in plug-in efficiency. Of course, Hyundai subsidiary Kia has shown its mettle with the Kia Soul EV that has been around on the U.S. market for a few years. 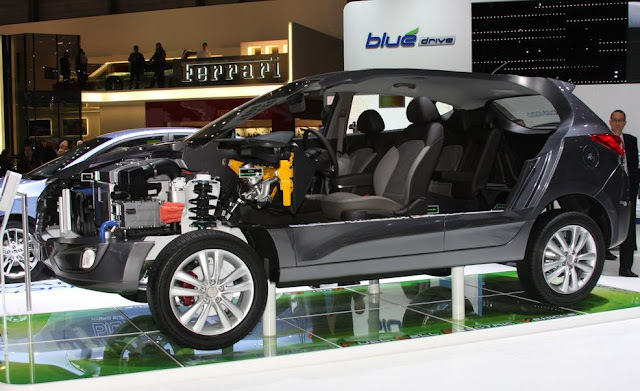 Due to limited availability and relatively little promotion, we never saw this model take off in America, but the Korean motor group proved it has the capacity to produce a highly efficient (120 miles per gallon city) and long-range EV (93 miles) at a competitive price point. Nonetheless, the real test comes when the Ioniq series begins arriving in different world markets this summer. Hyundai laid down the gauntlet by saying the hybrid model would top Toyota Prius in efficiency. After Prius Prime set a new standard for plug-in hybrids, we wonder if Hyundai plans to make that model’s elite economy numbers (120 miles per gallon equivalent) its next target. 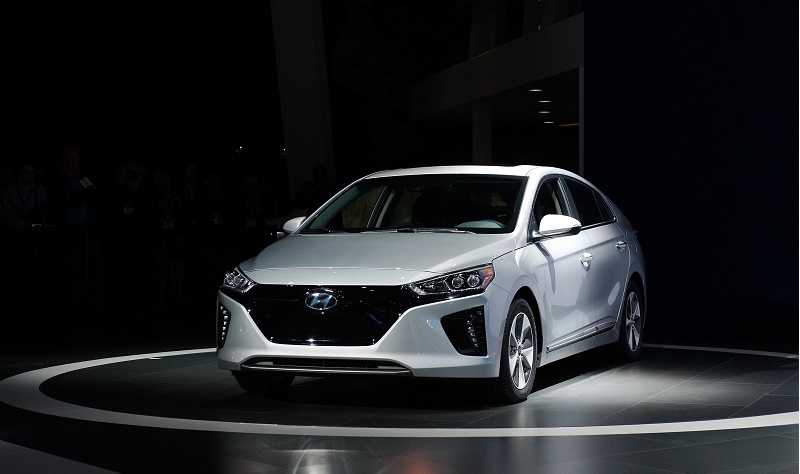 Either way, much is riding on the Ioniq’s three-pronged debut. As Hyundai officials made clear at the U.S. debut of the Ioniq, this car must be a success to bode well for future electric products from the brand. Consumers are already comfortable/happy with the Prius if they want a standard hybrid or plug-in; they are likewise happy with the Nissan Leaf if they want an EV with about 110 miles of range, as the Ioniq will feature. In order to have an edge over the competition, Hyundai must deliver on that fun-to-drive element consumers once complained Prius did not have. (New models have enjoyed a better reception.) Stylistically, the automaker did excellent work in trying to remove the dorky EV stigma from the Ioniq line. These cars don’t scream “it’s electric!” and that is exactly how the designers planned it. Having a lower price than the competition wouldn’t hurt. There is still no clear recipe for the success of a plug-in vehicle in America; some quality cars failed because the automaker saw limited profit potential and kept them as compliance vehicles, others simply failed because the drive or range was not good enough for the cost. Before a Hyundai electric vehicle shoots for 200 miles followed by 250 miles in the lower end of the segment, its first effort will have to make a great impression on consumers. Fatherhood offers the opportunity to no longer feel compelled to be cool or fashionable. My Brooklyn neighborhood seems to be split between dads who embrace this freedom and those who consider their kids another expensive accessory. The Hyundai Veloster Turbo Rally is that dad still trying hard to be cool. I should probably clarify here that there’s no way in any world that I was cool or fashionable before Bette came into my world, so I didn’t have a lot to change upon becoming a father. The most common refrain I heard from coworkers when they found out my wife was pregnant was “Now your sense of humor will be more appropriate.” You could say the same about how I dress. Williamsburg is not cool. I’ve been told it was cool at one point. It’s possible that it was cool as recently as the day before I lived there and I was the J. Crew checkered oxford that broke the camel’s back. It’s not like I walk around in a garbage bag. I put some thought into my appearance, but I look so much like the casual Brooklyn dad in my not-too-skinny Levi 511s and My-Aim-Is-True glasses that a toddler at a daycare I was visiting immediately latched onto my leg when I got into his field of view. “You look just like his dad,” one of the daycare’s employee’s said. I do. I look like all the dads. 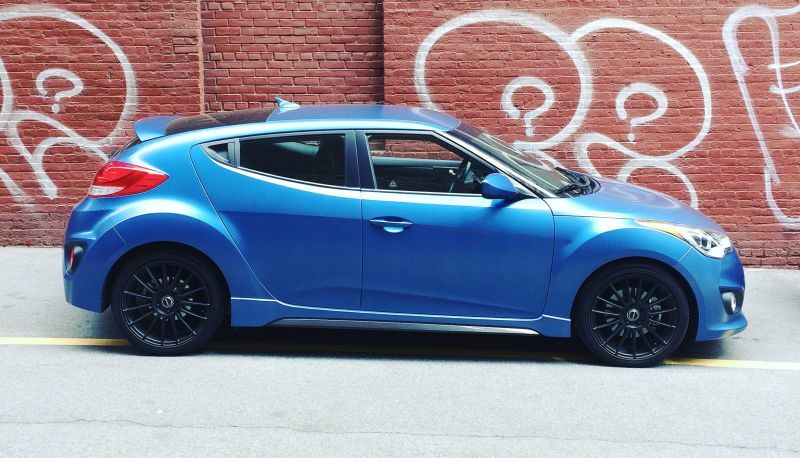 The Hyundai Veloster Turbo Rally does not look like every other hatchback on the market. It looks like it wants you to think it’s a high performance hot hatch. Why else would it have factory matte blue paint, pieces that look like carbon fiber, a big chrome-tipped exhaust, and GENUINE 18-INCH RAYS ALLOY WHEELS? It works. If you didn’t know anything about this car, merely by looking at it and seeing the words “TURBO” and “RALLY” you’d assume it was fast. It is not. This isn’t to say the car is slow. With slightly more than 200 horsepower and a reasonably low sub-3,000 pound curb weight it’ll shuffle to 60 mph in less than seven seconds. The version I drove had a six-speed manual modified with a short-shifter and hustling through the gears was enough to get Bette’s eyes to widen while accelerating up an on-ramp. I didn’t love the shifter, but it’s a better experience than the regular Veloster Turbo I tested a couple of years ago. Hyundai has said in the past that the take rate on manuals for the Veloster is nearly one-third so I’m glad they’re improving the experience. As I’m becoming more comfortable with having the most important thing in the world in the backseat I’m able to sneak in a quick turn here and there. Fitting for a car designed to appeal to video gamers, the car will plant the tires firmly on any corner with a minimum of fuss even though there’s no obvious connection between the steering wheel and the rest of the car. The suspension has been stiffened, we’ve been told, and I’m sure that’s true. The ride is firm. Does it make the handling any better? I’m less sure about that. I like cream cheese on my bagels, but I don’t use an entire tub of it. I have the same feeling about suspension tuning on pseudo-performance cars and there’s just a little too much cream cheese on this bagel. Ultimately, the Veloster Turbo Rally looks faster than a Focus RS and is slower than a Focus ST while being sized somewhere closer to a Fiesta. That’s fine. If you’re a new dad and you want to look fast and want to sometimes downshift and make a noise (not a great noise, mind you) then you can definitely baby in the Veloster. Jason had it a little easier because, at the time, Otto was in a forward-facing seat, which takes up a lot less space than the rear-facing model I’m stuck with until Bette gets older. Even so, the Veloster is large for a subcompact and both a pint-sized human in a car seat and a full-sized can stretch into the back without compromising too much room in the front seat. Getting into the Veloster is where the challenge lies. Though the Hyundai looks like a three-door from the driver’s side, it’s actually a four-door thanks to the rear door on the other side. Because I live in a place with opposite-side-of-the-street parking, this means that roughly half the time I could load Bette in from the sidewalk, which was excellent. The rest of the time I had to push her stroller out into the street or find an open space near a fire hydrant in order to open the appropriate door. While not ideal, it’s still better than no extra door and I like the funkiness of it. What was more challenging from a parental perspective is that the rear is raked fairly sharply and has a big piece of glass that sits over where Bette’s face is. This means I had to worry about blasting her gentle skin with UV rays the entire time. Getting the car seat in and out was also slightly challenging because of the sharpness of the roof, but the seats back there didn’t say “TURBO” so that’s a plus. The most baby-worthy part of this car is actually the cargo area, which is deep and spacious for a vehicle this size. I had no trouble getting an overstuffed diaper bag and our travel stroller in there. More importantly, changing diapers anytime and anywhere is a skill you need if you’re going to be a new dad. This is essentially the parental equivalent of diffusing a bomb without the handy timer that madmen seem to include for dramatic purposes. Bette wired one up while we were trying to enjoy lunch at a restaurant that, for some cruel reason, had no flat surfaces in either restroom on which we could change her. I did the geometry in my head and realized there was probably enough space in the trunk of the Veloster to make it work. I laid out my extra diaper, wipes, trash bag, changing pad, and hand sanitizer and there was plenty of room to do my work. Because it’s so deep, Bette also had more privacy than she normally gets when we’re out in the world. Would I baby it? Sure. The Matte paint is begging to get wrecked by a larger kid and I’m not sure the suspension upgrades make the car much better, but I still think the Veloster is a smart and interesting package. If I were in the market I’d get a regular Turbo manual with navigation and buy the shifter as a kit and call it a day and spend about as much as the model pictured above. Compared to the 1970s era Volkswagen Beetle I was carted around in this thing is a Bentley and it will certainly baby. With some tweaks to the steering and a little more power the next generation Veloster could be a car that’s as cool as it looks. Hyundai says it will launch its next fuel cell vehicle in 2018, and that it will be another hydrogen-powered sport utility vehicle. While previously offering a broad picture of its next fuel cell vehicle, Hyundai Vice Chairman Yang Woong-chul said on Wednesday that the Korean automaker will roll out its next-generation fuel cell vehicle in early 2018. The company’s goal is to better compete with Japanese rivals and meet tougher emissions rules, he said. Like the Hyundai Tucson Fuel Cell, the next fuel cell vehicle is expected to be a sport utility vehicle. That will be in contrast to the hydrogen-powered fuel cell sedans sold by Toyota and Honda, a South Korean newspaper reported. The Toyota Fuel Cell compact SUV, the world’s first mass-produced fuel cell vehicle, was launched in 2013. Sales have been less than Hyundai due in part to lack of hydrogen refueling stations and a high price tag. 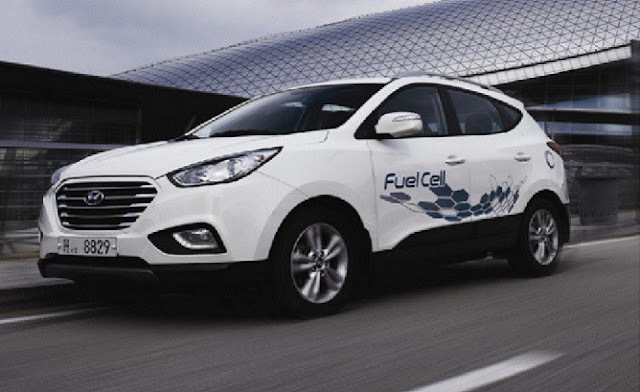 The new fuel cell SUV is expected to nearly double the driving range of the Tucson Fuel Cell. The new fuel cell vehicle will be able to travel about 497 miles per fueling, the Electronic Times reported in January. Hyundai declined to comment on details of the new fuel cell vehicle when contacted by Reuters. Hyundai also plans to launch its first battery-powered car before the end of this year. The Hyundai Ioniq, which will be available as a hybrid, all-electric, or plug-in hybrid, will be available later this year. 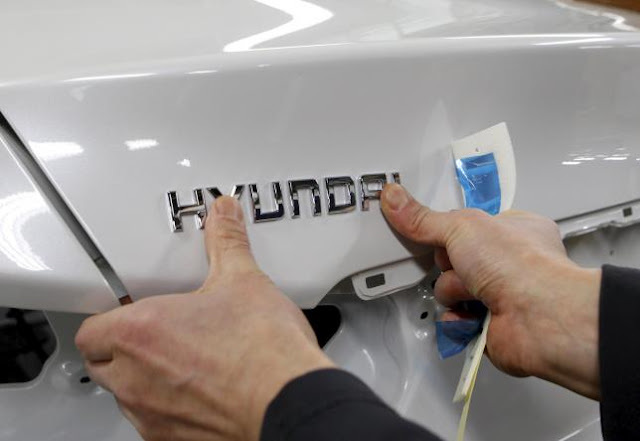 For years, Hyundai Motor America and its dealers tracked the satisfaction level of service department customers with a survey containing as many as 40 questions -- some of them multipart. Completing the lengthy questionnaire discouraged many customers from spending time on detailed comments, depriving dealers of a valuable tool, says Michael Deitz, senior group manager in charge of owner marketing. The data was aggregated on Hyundai's internal dealer website, where looking into individual problems or reading verbatim comments required a service manager to drill down into the results. Follow-up mechanisms were clunky. Worst of all, the system wasn't able to tell whether or when service staff followed up with customers who reported a bad experience. Deitz: "Our desire is to stop chasing the number and focus on the experience." To get a better grip on service satisfaction, Hyundai is rolling out a three-prong approach, including a customer retention survey due by early next month. The new process started in late 2014, when the company began asking customers within two days of picking up their serviced vehicle for a brief review like those on Amazon and Yelp. The e-survey, managed by SureCritic Inc., takes less than a minute to complete and can be done on a smartphone, tablet or computer, Deitz says. The review is private -- shared only with Hyundai and the store -- but the customer has the option to make it public. The dealership may respond in the same forum. Part two of the plan was launched in March, when the company introduced the streamlined 16-question Hyundai Service Experience Survey. A week after their visit, it is mailed to 35 to 40 percent of repair and maintenance customers -- a sample size Deitz says is statistically sufficient. Both new surveys provide near-instantaneous results, and service managers are alerted of incoming customer reports, complete with verbatim comments. The platform that supports the longer survey tracks the service manager's response. The two processes are "good at diagnosing where the problem lies," Deitz says. "And now we have a robust way of capturing dealer follow-up." Coming by early June is a third component: a customer retention survey. A "lapsed customer" -- one who doesn't bring in the vehicle for routine maintenance within a year -- is no longer relegated to a once-yearly mass mailing from Hyundai. Instead, as soon as the system notes the lapse, it emails that individual with questions aimed at understanding why the business was lost. The multiple-choice questionnaire asks in detail why the person hasn't returned, where the service was done instead and what it would take to get the customer to return to the dealership. The survey also inquires whether the customer intends to buy another Hyundai eventually and whether it would be at that dealership. The timely report about an individual customer, rather than a group, "will give us an opportunity to reach out and try to get you back," Deitz says. Sometimes, all it takes is a coupon, a free car wash or a persuasive explanation of dealer-exclusive services such as software updates, he adds. The retention survey also highlights problems that might be fixed before more customers are alienated. And the service manager knows not to waste time chasing customers who sold their vehicles or moved away. After poaching Bentley's design chief last year, Hyundai Motor Co (005380.KS) said on Monday that it has also secured the services of the luxury marquee's exterior designer. Lee is being brought in to work with Luc Donckerwolke, a Peruvian-born Belgian, to lead Hyundai's development of its Genesis premium car brand - a project driven by Chung Euisun, heir-apparent to the Hyundai Group. "Lee will help...enhance the design competitiveness of both the Hyundai and Genesis brands with his abundant experience in designing high-end luxury vehicles," Hyundai said in its statement. "His challenging and innovative design languages fit well with the DNA of Hyundai Motor." 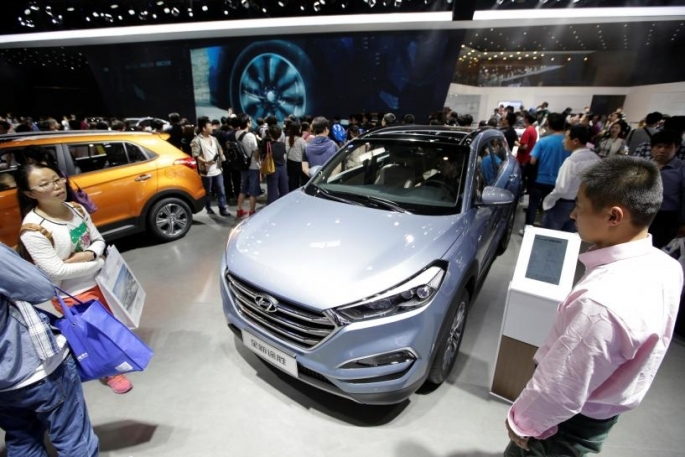 Hyundai Motor, which sells some 8 million cars a year, sees limited growth unless it breaks into new markets, a person close to the automaker told Reuters. For the South Korean firm, that means premium cars and maybe pick-up trucks and parts of Southeast Asia. Lee said he has joined Hyundai Motor as a vice president in charge of Hyundai and Genesis design, reporting to Donckerwolke, who will head up Hyundai's new Prestige Design Division, as well as being global head of Hyundai design - a reporting arrangement that Hyundai also confirmed on Monday. Bentley spokesman Andrew Roberts confirmed Lee "has resigned from Bentley to take a position at another brand." Lee, 46, ran Bentley's exterior design since 2012 having previously worked at Volkswagen (VOWG_p.DE) group's design center in California, and General Motors (GM.N). He played a lead role in designing the Chevrolet Corvette, Stingray and Camaro - which featured in the "Transformers" movies - and Bentley's Bentayga SUV. Lee told Reuters the ex-Bentley design duo aim to make Genesis a recognized global premium brand as new disruptive technologies such as autonomous, connected cars and alternative propulsion systems alter the auto design landscape. "Because of these technologies, the car industry is about to hit a crossroads. The future is truly open," he said. "It's difficult to say if all the prestigious brands today will still be around in 10-20 years." Lee, who says he was first approached by Hyundai two years ago, said he and Donckerwolke plan to design Genesis cars from a "clean sheet of paper". "For decades, luxury brands such as Bentley, Aston Martin and Maserati have been about possession," he said. "In the future, as disruptive technologies kick in, luxury is going to be about experience. People are going to look for a special experience rather than something special to own." As "mobility on demand" - the once futuristic concept of calling up a robot-car by smartphone - takes hold, Hyundai predicts many households in the United States, its biggest market, will no longer own two, or three cars, but spend more on one car, said the person close to the company. "That means upscale cars," he said, adding "profitability-wise, the luxury segment is much better, too." That fits with Chung's aspiration to not just drive the Genesis brand but elevate the Hyundai name to an elite global corporate league alongside the likes of BMW (BMWG.DE), Boeing (BA.N) and Apple (AAPL.O). "That's his legacy. ES (Euisun) wants to make Hyundai a truly globally recognized and respected company," the person said. Chung was involved with hiring both Donckerwolke and Lee, as well as Manfred Fitzgerald, former brand and design director at Lamborghini who was named earlier this year as head of Genesis, said another person with knowledge of the matter. 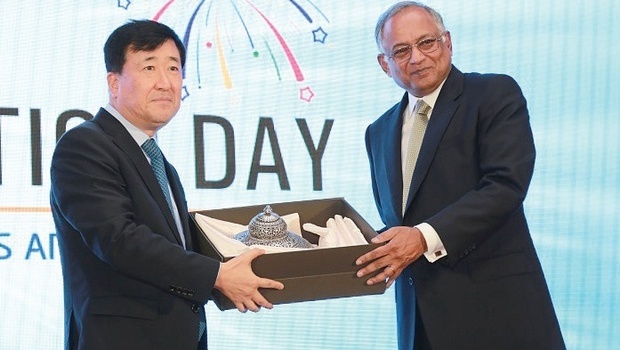 Hyundai Motor India will be celebrating 20 years of its Indian operations this year, and to make the occasion special, the company is planning several programs. After starting its Indian journey in 1996, the auto giant has come a long way. In its milestone year, the company’s managing director Young Key Koo has spoken about Hyundai’s vision to reach more customers by launching two new products every year, expanding its footprint across the country to offer the customer, products and services beyond their expectation. Over the years, they have succeeded maintaining a similar strategy. HMIL’s state-of-the-art manufacturing facility is being upgraded and automated periodically. Currently, the investments stand at $3.1 billion with vendor investment at $1.5 billion. The top management of HMIL, vendors and dealer partners received a baton-scroll from Koo as a token of their pledge and strong commitment to achieve company's vision of becoming ‘a market leader’. As part of the year-long celebrations, the company has also launched a new logo to illustrate its 20 years of success and togetherness in the country. As a gesture of appreciation and goodwill, the company will organize a grand carnival for its employees. The new Hyundai Tucson has won the coveted People’s Choice trophy at the AA Car of the Year Awards gala event held in December 2015, as part of a dominant sweep of category awards by the brand. Hyundai New Zealand General Manager Andy Sinclair says Hyundai took five awards, winning Best Luxury Car and Safest Car 2015 (Hyundai Genesis); Best Large SUV (Hyundai Santa Fe); Best Medium SUV and People’s Choice (Hyundai Tucson). He says all five awards are a humbling but fitting accolade for the brand, while winning the People’s Choice award just months after launch is a “fantastic” endorsement of the Tucson and of Hyundai’s relationship with its family of owners. Almost 35,000 people voted in the People’s Choice category, where Tucson faced stiff opposition from the nine other COTY contenders, all with their own particular strengths and unique features. “To win against some worthy rival offerings from a wide range of brands is a testament to the desirability of the new Tucson, which is fast on its way to becoming the vehicle of choice in New Zealand’s white-hot medium SUV segment,” Mr Sinclair said. The latest accolade for the Hyundai Santa Fe builds on its win in the large SUV category in 2014 and comes as New Zealand’s most popular large SUV receives a model year refresh intended to help it maintain top spot in the coming year. The 2016 Hyundai Santa Fe was named the Full-size Crossover Utility Vehicle of Texas by the Texas Auto Writers Association (TAWA) during its 23rd Annual Texas Truck Rodeo at the Knibbe Ranch in Spring Branch near San Antonio. “We are delighted to hear that the Texas Auto Writers Association recognized the 2016 Hyundai Santa Fe as the top contender in a highly competitive category,” said Mike O’Brien, vice president, Corporate and Product Planning, Hyundai Motor America. This win complements the Santa Fe’s victory as CUV of Texas in 2013 and as Compact CUV of Texas in 2012 for its smaller, 5-passenger sibling Santa Fe Sport. During the 2015 Texas Truck Rodeo, more than 70 TAWA members evaluated some of the industry’s leading trucks, SUVs and crossover utilities. In order to put each vehicle through its paces, the famed Knibbe Ranch in Spring Branch, Texas served as the event’s proving grounds. With driving surfaces including bumpy pavement, loose gravel, slick mud, steep hills, jagged rocks and water crossings, each candidate stayed busy throughout the two days of testing. 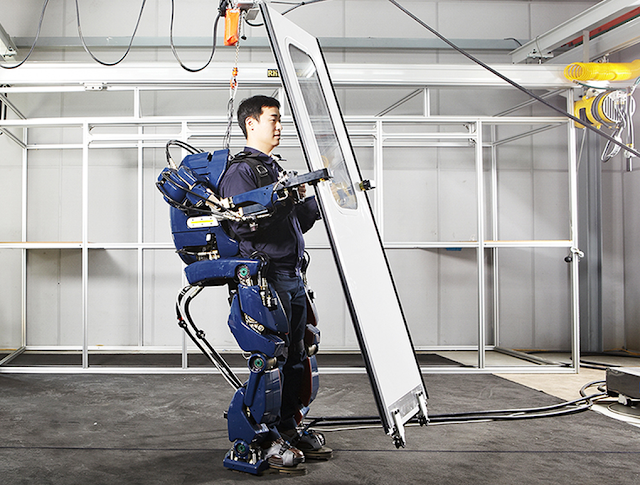 South Korean automaker Hyundai has unveiled what is apparently a new robotic exoskeleton. In a blog post the company compares its "wearable robot" prototype to an Iron Man suit, saying it gives the wearer extra strength, allowing them to lift objects "hundreds of kilograms" in weight. The company says that in the future the exoskeleton could be used in factories, by the military, or to help with physical rehabilitation. It's not entirely clear from the blog post (thanks Google Translate for doing what you can), but the suit appears to be a development of Hyundai's H-LEX platform — a similar exoskeleton the company unveiled last year. The H-LEX suit (it stands for Hyundai Lifecaring ExoSkeleton), is more lightweight than the prototype in these new pictures, but had near-identical functionality, designed to help senior citizens and the physically disabled. Hyundai isn't the only company working on robotic exoskeletons, of course. Panasonic is developing similar suits for factory workers; some researchers are working on lightweight, leg-only contraptions for everyday use; and car companies like Audi and BMW are already trialling exoskeletons that let engineers sit in mid-air without straining their backs. It's not exactly Iron Man, but it'll do for now. 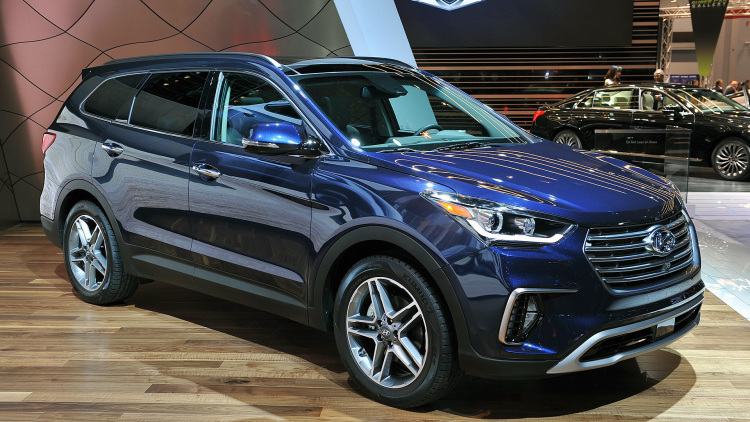 The Hyundai Santa Fe has been one of the top choices for a seven-seat family SUV for some time now. Despite newer versions of the Nissan Pathfinder, Toyota Kluger and Kia Sorento all arriving after the third-generation Santa Fe, an update at the end of 2015 has helped maintain its appeal. The top spec Highlander continues to be the most popular version of the Santa Fe, and here’s our top 5 reasons to buy it. At 4700mm, the Santa Fe is a bit shorter than its newer rivals, which along with a lower bonnet makes it surprisingly easy to manoeuvre in tight situations. The middle row of seats slide to balance room across all rear passengers, so if you’re seating short people in the middle you can give taller third row passengers more space and vice versa. Third row passengers also get their own ventilation van control, and the seats are all pretty easy to put up and down. There’s also a total of four 12V power sockets, and cargo storage ranges from a generous 516 litres VDA with the third row up to 1516 litres with both rear rows folded. The Highlander has all the toys you could really ask for, as standard. From leather trim, to satnav, to a glass panoramic sunroof, electric tailgate, heated and ventilated front seats, active cruise control and a full-size alloy spare. The Highlander also has an auto parking system, which can deal with both parallel and 90-degree parking spots. The Santa Fe is the first in its class to offer AEB, which is fitted standard to the Highlander. Aside from a maximum five star ANCAP safety rating, the Highlander also gets blind spot, lane departure and rear cross traffic alerts. The Highlander gets a responsive and efficient 147kW/440Nm 2.2-litre turbodiesel engine standard. Its lazy urge and highway efficiency is better suited to the typical usage of these vehicles than a big petrol V6, and is rated at an impressive 7.7L/100km on the combined cycle. The Santa Fe’s basic ‘Fluidic Sculpture’ design may be four years old, but minor changes with last year’s facelift has helped it keep its edgy, hatch on steroids look that many people will prefer over the ‘king of the road’ look of some big SUVs. Ever since Hyundai split the Genesis off into its own brand, we've all been clamoring to find out what other models would join the lineup. And here we have one more piece of the puzzle. According to Automotive News, the Korean luxury brand is set to get its own plug-in hybrids. We just don't know which model or models will serve as the basis. "Some of those [plug-in hybrids] will take the form of the Genesis side of our business," was all that Hyundai Motor America CEO David Zuchowski said. "We believe alternative-propulsion engines are going to be really important – even more important in the luxury market than they are in the mainstream market." Hyundai's Genesis brand would not, of course, be the first luxury marque to launch a PHEV. Premium brands like Audi, BMW, Mercedes, Porsche, and Volvo all offer plug-in versions of their mainstream models, while others like Cadillac and Infiniti prepare to join in the near future. Hyundai and its Kia brand both offer plug-in hybrids, though nothing at the level of the Genesis or Equus that have now been rebranded in the new lineup. So far we've seen the Genesis G80 take over from the previous Genesis sedan and the G90 take the place of the Equus. A new G70 sports sedan is slated to join soon, along with a two-door to replace the Genesis Coupe and a crossover expected to take over from the defunct Veracruz. 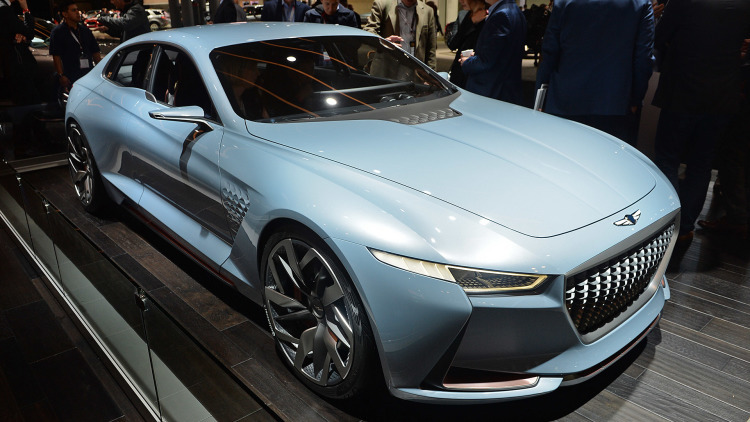 Pictured here is the Genesis Hybrid Sports Sedan, an electrified concept that the automaker showcased at the New York Auto Show less than two months ago that previewed the brand's new design direction and 3 Series-fighter as much as any specific powertrain configuration. If we were the betting type, we'd anticipate the hybrid propulsion system to be offered first on one of the sedans, but we'll have to hold on to find out what they decide in Seoul. The all-new Elantra Sport has not only been revealed in Korea but it's also available to drive there. Hyundai has built a big fleet of vehicles for the local press to have a turn and we've sampled some of their videos for you guys to enjoy. The car is still on track to arrive as a 2017 model year, and we think it's going to be popular. It's got a 1.6-liter turbo engine, just like the one in the Tucson, only with a higher state of tune and more technology than Hyundai's Veloster Turbo. If you just want to know about the performance, watch the first video. 200 horsepower sounds like enough to make a fast compact, especially when the Golf GTI had just ten hp more. But it lacks punching power and torque. Sure, the Elantra Sport looks fast, taking 7.1 seconds to reach 100 km/h, but the Civic 1.5 Turbo isn't that far off. If you're looking for the ultimate thrills with a small engine, they are still found in the Ford Fiesta ST. However, the new Hyundai model comes with other benefits. There's a new body kit and paint options that set the Sport apart from both the competition and the regular Elantra. The 18-inch wheels are also standard. We figure it will be a great car for people who want a grown-up compact with Gran Tourer characteristics, especially as the rear suspension has been upgraded to a multi-link setup. It will feel both more planted and comfortable, which is like having your pie and eating it. Overall, this is not the type of car that will win the Vienna Motor Symposium, but it won't bankrupt you either. Something as simple as a red leather interior and white analog dials shows that Hyundai knows about people who love luxury cars but can't afford them. Even if the turbocharged Elantra doesn't challenge the CLA 45 AMG, it can still keep up with that guy with a BMW 328d that you hate so much, and that kind of puts things into perspective. What would you think if we told you that you can now have a full 360 degree live view right in front of you when you back up your vehicle? 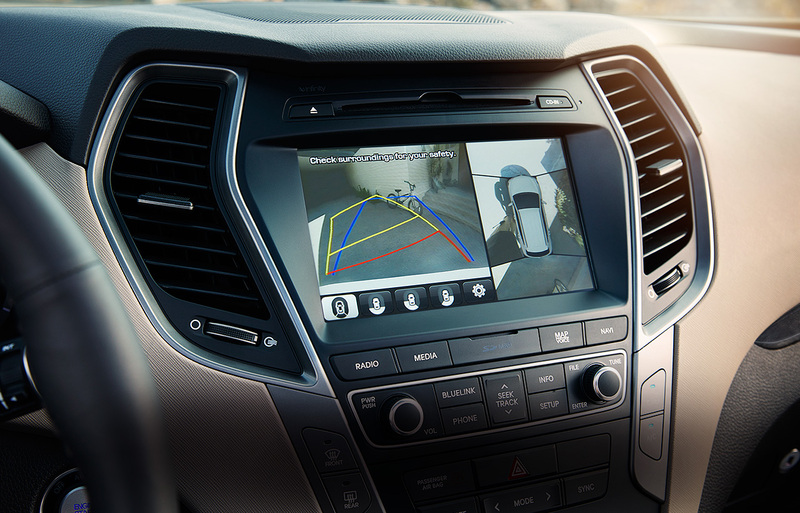 The 2017 Hyundai Santa Fe Sport offers a multi-view camera system that features four cameras strategically placed around the vehicle to provide four different views including an aerial view of your vehicle and all of its surrounding obstacles. The four cameras are located: in the grille, one on each of the side mirrors and one on the rear of the vehicle. When turning on your multi-view camera system you will first see the 360 degree view of your vehicle on the navigation screen located on the dash of your Santa Fe Sport. On the bottom of the screen there are four viewing options (from rear, side or front views). The option is yours for whatever view best fits your parking experience and when you are done the display will automatically switch back to it's normal display. Before you begin car buying research, a good rule of thumb is to spend no more than 20 percent of your monthly income on a car loan payment. People buying a car often forget to consider many of the hidden costs involved in purchasing a vehicle. Some of these hidden costs include depreciation rate, insurance and average miles per gallon. The true cost of a vehicle goes well beyond the advertised MSRP. "Look into what fees the actual dealerships will charge to do business. There are documentation fees; there are banking fees; there are different levels of charges," explained Kevin Schechterle, a director at Gary Rome Hyundai. Along with these items, Schechterle encouraged interested car buyers to research how their own credit rates, as well as down payments, affect their monthly payment, and what APR rates are available and whether it will be better to get preapproved. 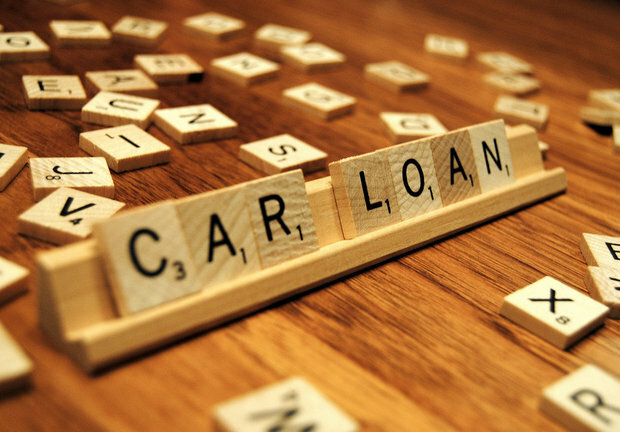 Extra research is worthwhile because a car purchase frequently means borrowing a lot of money. When it comes to hidden costs, the easiest thing to overlook is simply the sales tax, followed by dealership fees. Documentation fees can actually range from a couple hundred dollars to as much as 700 dollars. The benefit of a trade-in car buying situation is that this offers the opportunity for a tax write-off or tax benefit. If you decide to sell your car personally, taxes will have to be paid upfront. To start, do some research online to find out just how much your car is worth in a resale versus a trade. Next to finances, it is also important to consider features you need in comparison to features you want in a vehicle. At this time, the items you list as "needed features" should be confirmed first and foremost, such as those pertaining to safety and reliability. As for smart investments to make when purchasing your vehicle, "Hands-free technology is important to safety," said Schechterle. Another smart investment is using what you would have spent on "flashy items such as bigger, better-looking wheels" on an extended warranty, which will ensure your safety in your vehicle as it ages. Along with extended warranties, options such as peace-of-mind warranties and certain accessories can be beneficial for some buyers, which are sometimes included. If you wish to obtain a preapproved loan, look to credit unions and local banks first. While many car dealerships prefer to do the majority of work with a certain bank, going to a local bank yourself may result in a better rate. It's also possible to simply ask a salesperson or their manager about the types of financial options that are available before you buy a car. "Local banks tend to want to do business with local people," said Schechterle. "Being preapproved gives the buyer a little more of a point of leverage." Researching beforehand can potentially save you time and money. Capitol Hyundai of San Jose, Calif., a member of the Del Grande Dealer Group, has delivered the first zero-emissions Hyundai Tucson Fuel Cell hydrogen electric vehicle in the Northern California region today. 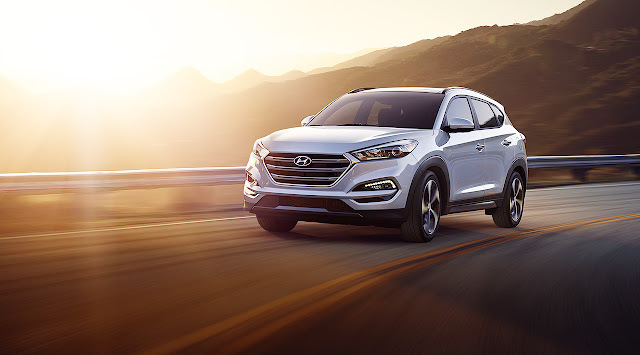 According to Capitol Hyundai, it is the fifth qualified dealer for Hyundai’s Tucson Fuel Cell and the first Hyundai fuel cell dealer in Northern California. Since its launch in June 2014, Tucson Fuel Cell drivers have accumulated more than one million zero-emission miles on the streets of California. This accumulated mileage has helped improve air quality in the region by more than 400 tons of CO2 emissions when compared with the emissions from a similar internal-combustion-powered CUV. Hyundai says it has delivered more than 100 Tucson Fuel Cells since its introduction as the first mass-produced fuel cell vehicle in the U.S. market. Capitol Hyundai joins the four other existing qualified fuel cell dealers in both Southern and Northern California, including Keyes Hyundai, Tustin Hyundai, Win Hyundai in Carson and Hardin Hyundai in Anaheim. Hyundai Motors Europe has appointed Vice Media to handle the September launch of the Ioniq, its new hybrid and electric car, with a campaign that will shun print advertising. 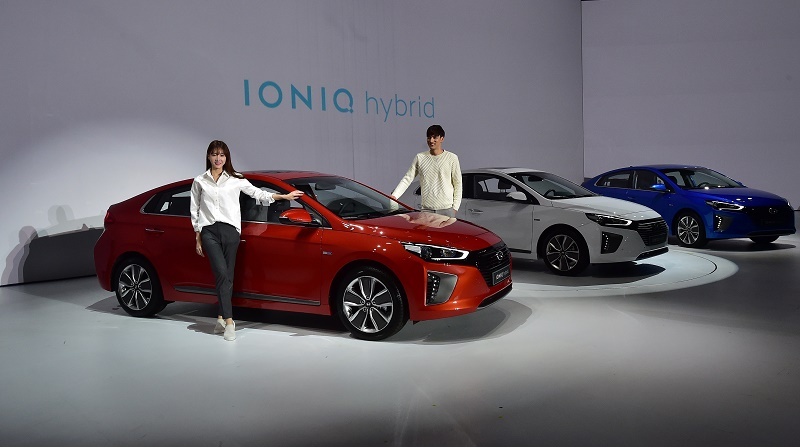 The South Korean automaker's global in-house agency, Innocean Worldwide – which created three Super Bowl spots for the brand this year – will play a supporting role in the Ioniq's European launch, working on implementation and distribution. Vice has been briefed to come up with the creative content, including video, social media and digital out-of-home. Razorfish, which has worked with Hyundai for the last three years, will work on mobile, website and digital delivery, and social media strategy, while media buying will be through long-standing partner Havas. 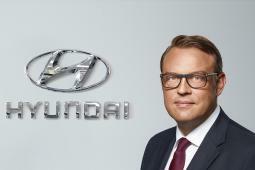 Hyundai Motor Europe's VP marketing, Jochen Sengpiehl, was SVP marketing at Volkswagen in 2009 when the German automaker won Advertiser of the Year at the Cannes Lions International Festival of Creativity, and is a former business development director at BBDO. He said, "Ioniq is a completely new proposition for us … so we decided to also bring in new talent and take a new approach, putting digital at the center of our communications and working with Vice for the first time. The electric hybrid is all about a mindset, not an age group, so it's a difficult audience to reach. It's for people who want to do something good, live in a sustainable way and also save money. You cannot make a traditional media plan for 'Generation Ioniq'." Given the tricky profile of his target audience, Mr. Sengpiehl asked his contacts at Google and Facebook who they would recommend for the Ioniq launch, and they both pointed him towards Vice. "The line between media companies and agencies has become liquid: successful communication requires the best talents regardless of labels," he said. "Vice can think out of the box and bring ideas alive. Their core business is fundamentally important for the future: identifying and reaching target audiences and influencers." The Ioniq will be available as a fully electric car, as a traditional gasoline hybrid, or with a combination of gasoline engine and electric plug-in. It is Hyundai's first hybrid or electric model in Europe, and represents a bid to make low-emission to zero-emission driving affordable. Hyundai is aiming to become the number one Asian car brand in Europe, where it has doubled its market share to 3.4% in the last ten years. In the first quarter of 2016, European sales rose to a record 127,000 vehicles. 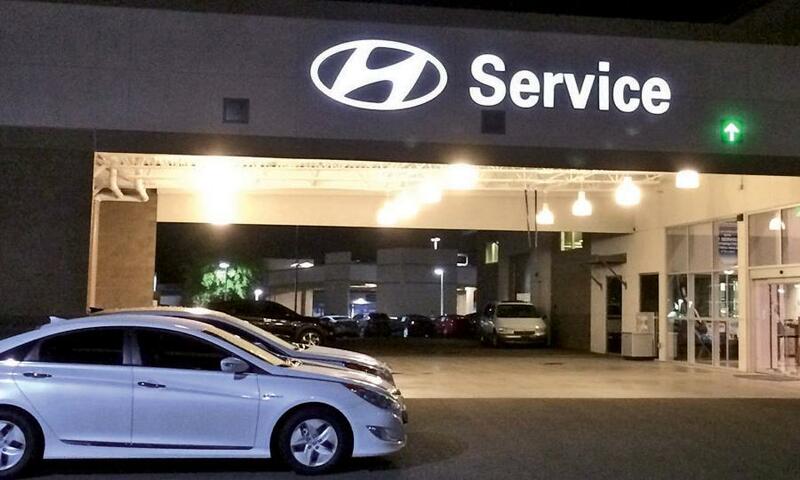 Mr. Sengpiehl, who joined Hyundai in November 2014, said, "We are a young, lean company. Everything we do needs to be efficient. We are never the leader but we are a fast follower, using our own approach to drive the technology forward. We want to democratize electric mobility – the Ioniq will be an ambassador and a game-changer." Hyundai's European agency line-up means that Mr. Sengpiehl is spending a lot of time guiding his agencies, but he added, "It's inefficient to have huge agency networks … It's better to ask networks to build a tailor-made network [for a client], to build a house of content. In five years there will be a whole new landscape in the agency world – there will be an explosion of spin-offs. Why should major global brands not make direct deals with Facebook and YouTube? It's about quality of content rather than savings." Asked whether Hyundai has been affected by the fallout from the VW emissions scandal, Mr. Sengpiehl said that Hyundai does not have defeat devices [which cheat emissions tests], and stated his conviction that the future will be about electric and petrol, rather than diesel. "With the focus on 'Dieselgate,' this is the perfect time to introduce people to a new idea," he said. "The hybrid may become a smarter solution than a diesel car." Hyundai Motors spent $1.9 billion on advertising globally in 2014, and is number 39 in the top 100 global marketers ranking, according to the Ad Age Datacenter. The company also counts arts sponsorship as a core pillar of its marketing strategy. The automaker has sponsorship deals with the Tate Gallery in Britain, the Los Angeles County Museum of Art, the Van Gogh museum in Amsterdam, and the National Museum of Korea, all of which have been signed for a period of ten years or more. Mr. Sengpiehl said, "You might not expect a value-for-money brand to have such deep engagement with the arts, but it's a great platform. Design is a strong communications point and it's the number one reason people choose Hyundai in Europe. We are democratizing premium design, and we want to do the same with art." Hyundai Motor Group (including subsidiary Kia) is world's fifth-biggest by sales, after Toyota, VW, General Motors, and Renault-Nissan, according to IHS Global Insight. The South Korean automaker sold 8.1 million cars in 2015, with China, where it sold a million cars last year, as its biggest market. 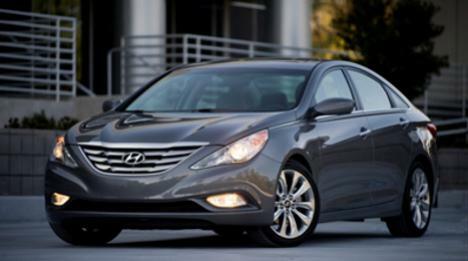 In the U.S., Hyundai has a 4.4% market share and sold 700,000 cars last year. Hyundai has just unveiled the 2017 Avante Sport in South Korea, globally known as the Elantra Sport. The company is set to launch the new Elantra in India too, however, there’s no confirmation about the sporty model accompanying the sedan. The specifications of the Hyundai Avante Sport state the car gets the Veloster’s 1.6-litre, turbocharged, four-cylinder, T-GDI motor that develops 201PS and 265Nm. The car comes with a 6-speed manual transmission as standard with the option of a 7-speed dual-clutch gearbox. Hyundai says the car accelerates from 0-100kmph in eight seconds. Hyundai has also replaced the torsion beam rear suspension on the standard car with a multilink independent suspension on the Avante Sport. Visually, Hyundai has tweaked the design a teeny bit to distinguish the Avante Sport from its sedan sibling. It gets lower side sills, larger front fascia (with a red turbo badge on the grille) and a rear diffuser with dual exhaust tips. The DRLs are now positioned horizontally, below the projector headlamps. The car runs on 18-inch alloys. Inside, it has a flat-bottomed steering wheel, larger bolsters on the front seat and faux carbon fibre trims to add to the sporty theme of the car. Hyundai will also sell an Extreme Package for the Avante Sport, in the South Korean market, in case customers don’t find the car sporty enough. The package includes a different alloy wheel design, spoiler and performance parts. The prospect of a sporty petrol sedan seems dull in the Indian market, with majority of the buyers opting for diesel powered sedans in the interest of better fuel efficiency. However, if Hyundai would be interested in catering to the remainder, the Elantra Sport (Avante Sport) could serve as its contender in the Indian market. 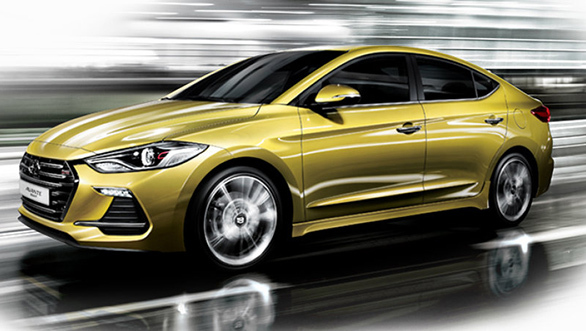 Hyundai will launch the Elantra in India this year and you definitely know what the icing on the cake will be. Hyundai and Lexus took top honors in the non-luxury and luxury categories, respectively, during Autotrader’s recent analysis of the best certified pre-owned vehicle programs. While manufacturers tend to offer a range of perks with CPOs, Autotrader opted to focus on warranty coverage. Hyundai’s CPO warranty offers five years or 60,000 miles of bumper-to-bumper limited coverage and 10 years or 100,000 miles of powertrain coverage from the car’s original sale date. The warranty offers a relatively low deductible of $50, and it is fully transferable to subsequent owners in a private sale. Meanwhile, Lexus’s “L/Certified” program offers limited bumper-to-bumper coverage for up to six years and unlimited mileage from vehicle’s original sale date. There is no deductible for covered repairs, and the program offers complimentary maintenance covering the next four factory-recommended services for two years or 20,000 miles. Honorable mentions in the non-luxury category were Chevrolet/GMC, Ford, Honda, Kia, Mazda, MINI, Mitsubishi, Subaru and Toyota. In the luxury category, they were Acura, Audi, BMW, Infiniti, Jaguar, Land Rover, Lincoln, Porche and Volvo. The selections for this year's Best CPO Programs were based primarily on warranty coverage, with a minimum of six years/100,000 miles for powertrain coverage. Other factors were bumper-to-bumper limited warranty length, warranty transferability and deductible amount. 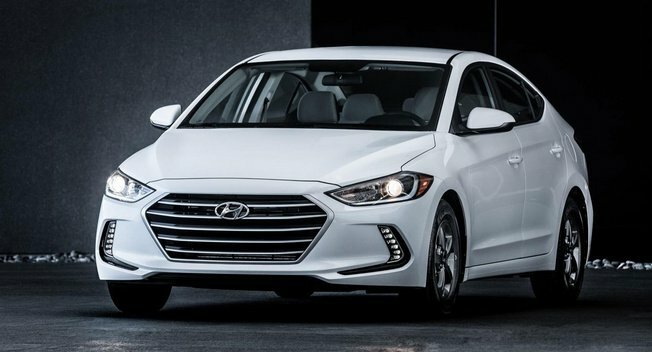 The Hyundai Elantra compact has been known for doing more with less on the dollar. The outgoing model won North American Car of the Year in 2012, arguably the industry's most independent and esteemed new-car honor, for being more luxurious, more fuel efficient and more versatile and roomier than a compact should at under $20,000. The fully redesigned 2017 model pushes advanced technology but it also pushes the price tag at a time when the compact segment has never been better. The base model is a bit cheaper than the outgoing model at $17,150, but the top-of-the-line Limited trim is $650 more than 2016, starting at $22,350. It's less expensive than the winning 2016 Honda Civic Touring, and the performance-leaning 2015 Volkswagen Golf. And it's loaded with everything from heated front seats to blind spot detection and a worry-free suite of warranties. The sixth-generation Elantra looks more advanced on the outside as well. 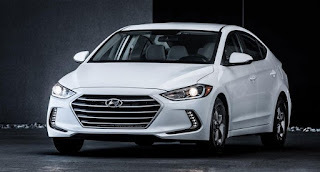 It sports Hyundai's big hexagonal grille and vertical daytime running lights similar to the Toyota Avalon, which along with new high-intensity headlights and standard 17-inch alloy wheels make the Elantra's extra inch of width and length look brawnier and more filled out. It doesn't look small on the outside or inside. It has enough interior volume to be classified as a midsize sedan based on the EPA, but don't let that fool you; so does the redesigned 2016 Honda Civic and the 2016 Toyota Corolla. Like the new Civic, four adults can fit comfortably and there is ample trunk space for a hockey bag, baseball gear and groceries. For driving feel, the Elantra has a tough time competing with the Golf, Civic and Mazda3. The Elantra's new 2.0-liter dual-overhead camshaft four-cylinder engine works hard to make 147 horsepower and a pokey 132 pound-feet of torque. In sport mode, those dual cams let the engine rev to 6,000 and 7,000 rpm before the new six-speed automatic transmission kicks in. Sport mode is fun but not as fun as the fuel economy gains of more than 2 percent, thanks in part to the powertrain and the use of more lightweight high strength steel. It's more rigid, making the ride quieter, but in everyday driving we didn't notice any great improvements to handling. Most drivers will notice fuel economy more, and the Elantra scored big with 45.3 mpg averaged over a few commutes at a 43 mph sweet spot, evidently. The EPA estimate is 37 mpg highway. The 2017 Elantra beats the Civic and Golf in the driver's main source of interaction, the connected car cockpit. The tester came with the tech package, which includes navigation and an 8-inch touch screen that is one of the better ones at this price point (especially compared with the Civic). Buttons and knobs complement the touch screen in a center-stack design that is conventionally familiar but not out-of-date. Consumers who are used to the classical console design and daunted by some of the botched newfangled attempts at simplification will appreciate it. Hyundai's redundant steering wheel controls use toggles in the middle for volume and tuning, with buttons on top and bottom. 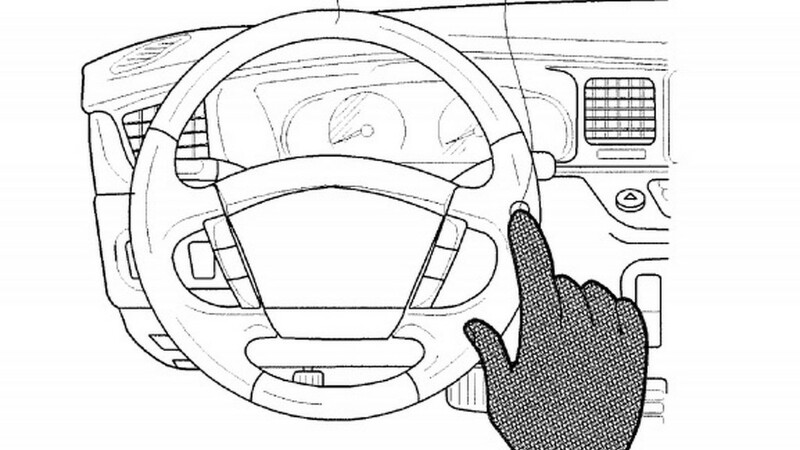 Thumbs used to texting or video game controllers will pick it up intuitively, while less-evolved users should be pleased that the fingers never leave the steering wheel. For $2,500, the tech package includes other goodies, including power sunroof, heated rear seats, a better sound system and Apple CarPlay and Android Auto. It's a pretty good deal for shoppers that see connected-car tech as a key convenience, and a distinct advantage over the Civic and Golf in a class packed with capable competitors.